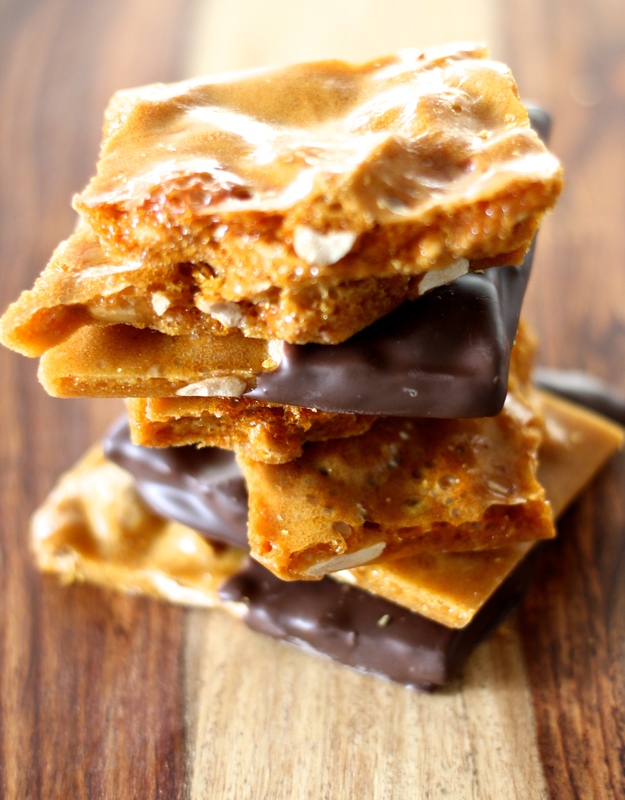 I debated posting these recipes, as they have nothing to do with a plant-based diet, and are only slightly vegetarian…but they have everything to do with holiday treats! That and I’ve been asked for the recipes enough times I figure the blog is the place they should be, so everyone can share the magic! I make these treats every year for the holidays–they mail well, share well, and are always loved and devoured! I usually double the recipe and keep this mix in a tupperware container on my shelf all year long. This also makes a great mix to share with neighbors for the holidays! Adapted from Mel’s Kitchen Cafe. Whisk together all ingredients in a large bowl. Working in batches, pulse the ingredients in a food processor or blender until the chocolate is finely ground. Store in an airtight container. 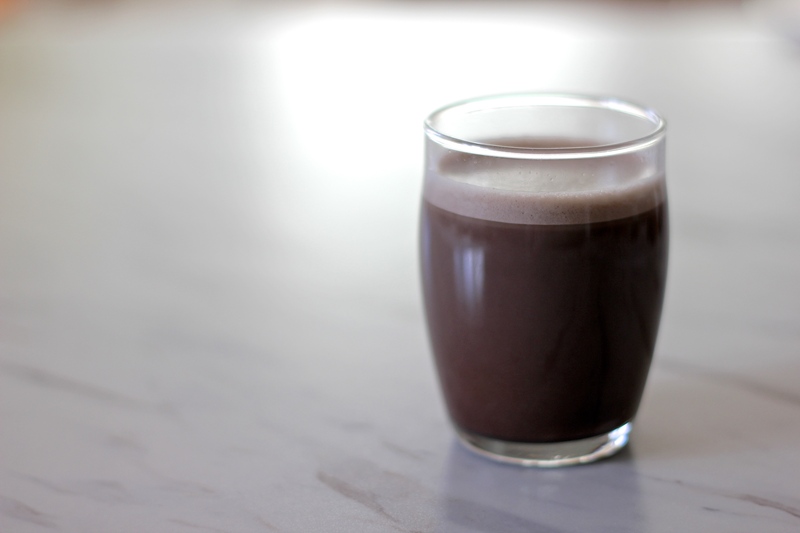 For hot chocolate, stir 3 tablespoons of the mix in a mug of hot milk. Difficulty: medium, due to time and multiple phases to make ice cream. But it's your very own gourmet homemade ice cream! Prepare sweet potato puree by baking one large sweet potato. Pull off the potato skin and puree the potato flesh in the blender. This step is best done the day before making the ice cream so the potato will cool in the fridge overnight. Separate the eggs, putting the egg yolks in a medium heatproof bowl. You can freeze the egg yolks for another use, or simply discard. Place a candy thermometer on the side of a medium pot. Put both sugars, cream, half and half, salt and cinnamon in a the pot and heat until the mix just scalds and there are tiny bubbles around the perimeter of the pot (it’ll be roughly 100F). Using a handheld mixer, whisk the egg yolks and gradually ladle the hot cream mixture into the egg yolks while whisking. This will temper the egg yolks and avoid having scrambled eggs for ice cream. Keep whisking the eggs while adding 5-6 ladlefuls of the heated cream mix. Once it looks soupy and the eggs are well-tempered, add the entire mixture into the cream mixture in the pot. Continue to whisk the mixture while cooking to 180 degrees. Remove from heat and pour through a fine-mesh sieve into a large bowl. Fill another large bowl with ice and the bowl with the ice cream mixture to cool on the ice. Once room temperature, place in the fridge and cool at least two hours or overnight. Once cooled, pour 4 cups ice cream mixture in the blender, one cup chilled sweet potato puree, and 3 teaspoons vanilla in the blender and mix until smooth. 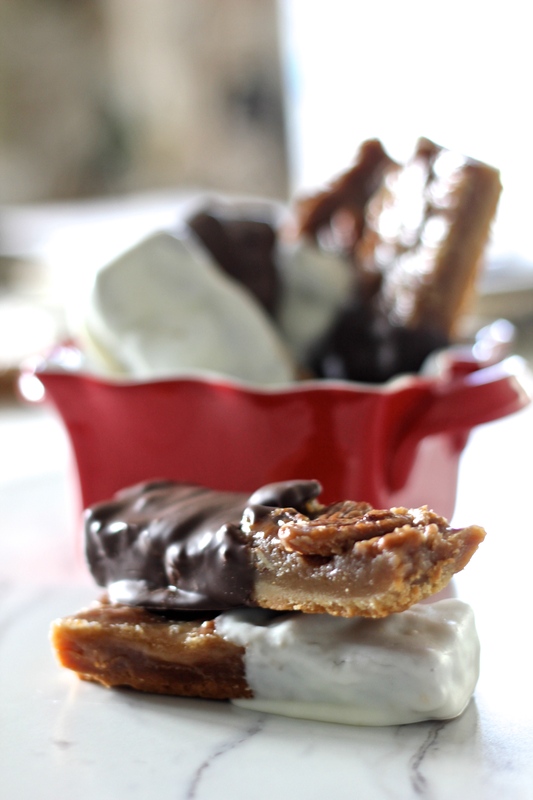 While ice cream is freezing, make the candied pecans. Melt 2 tablespoons butter in a medium saucepan and add the pecans. Stir while pecans are toasting, and gradually add the sugar, spoonful at a time, until it no longer melts into the butter and remains crystallized on the pecans. Once completely “sugared”, pour the pecans into a bowl and wait until ice cream is made. Once ice cream is ready, scoop some ice cream into your ice cream container, then add a couple small spoonfuls of marshmallow fluff, then sprinkle pecans. 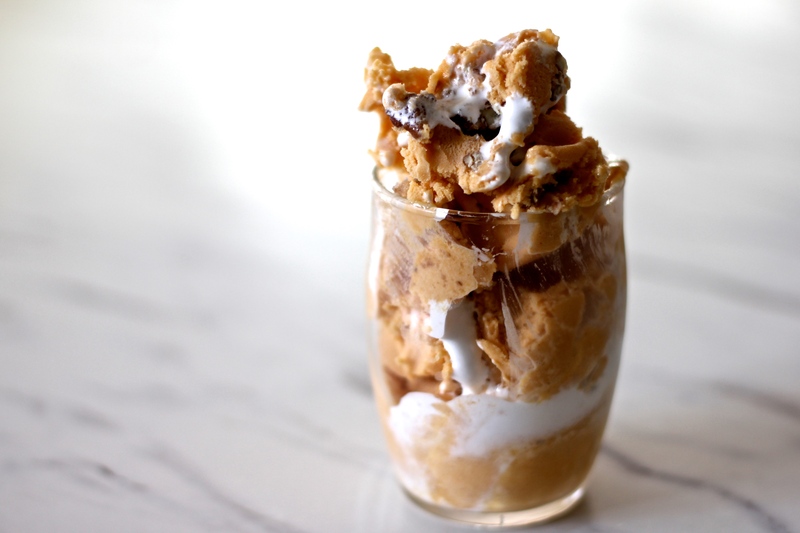 Continue layering ice cream, fluff, and pecans so when you scoop some ice cream to serve, it’ll be nicely swirled throughout. From Martha Stewart’s Cookies. To make even more delectable, dip the bars in chocolate. Preheat oven to 375F. Make crust: Put butter and brown sugar into the bowl of an electric mixer fitted with the paddle attachment; mix on medium speed until light and fluffy, about 2 minutes. Mix in salt. Add flour, 1 cup at a time, mixing until fully incorporated after each addition. Continue mixing until dough begins to come together in large clumps. Press dough about 1/4 inch thick unto a 9×13-inch baking pan. Pierce the dough with a fork. Chill until firm, about 20 minutes. Bake until golden brown, 18-20 minutes. Transfer to a wire rack to cool completely. Reduce oven to 325F. Make filling: Place butter, brown sugar, honey, granulated sugar, and heavy cream in a saucepan over high heat. Bring to a boil, stirring constantly until mixture coats the back of a spoon, about 1 minute. Remove pan from heat; stir in salt, nuts, and vanilla. Pour filling into the cooled crust. Bake until filling bubbles, 15-20 minutes. Carefully transfer to a wire rack to cool completely. Run a paring knife around edges of the pan and invert onto a cooling rack. Invert again onto a cutting board. Use a sharp knife to cut into 1×3-inch bars. Bars can be stored in an airtight container at room temperature up to 1 week. Adapted from The Complete Guide to Country Cooking. I have made this with peanuts as well as mixed nuts, and the results are always gourmet. To make them even more special, dip them in chocolate. Note: I have used rice syrup with great results, but I’ve never tried a vegan butter substitute. In preparation: Grease two large baking sheets with sides and keep warm in a 200F oven. Combine baking soda, 1 teaspoon water and vanilla in s small bowl and set aside. In a medium pot, combine sugar, 1 cup water and corn (or rice) syrup. Cook over medium heat, stirring constantly, until a candy thermometer reads 240F (soft-ball stage). Stir in butter, salt and peanuts; heat and stir until the mixture reaches 300F (hard-crack stage). Remove pot from the heat; vigorously stir in baking soda vanilla mixture. Quickly pour half the mixture over each cookie sheet. Let cool completely before breaking into pieces. It’s a rule in my house that if something has fruit in it, you can eat it for breakfast. And as this pie has a fruit (apple) AND a vegetable (pumpkin), it’s definitely a breakfast food, and as I have a “Breakfast For Dinner” category, I’d say this pie definitely makes the cut for the blog. 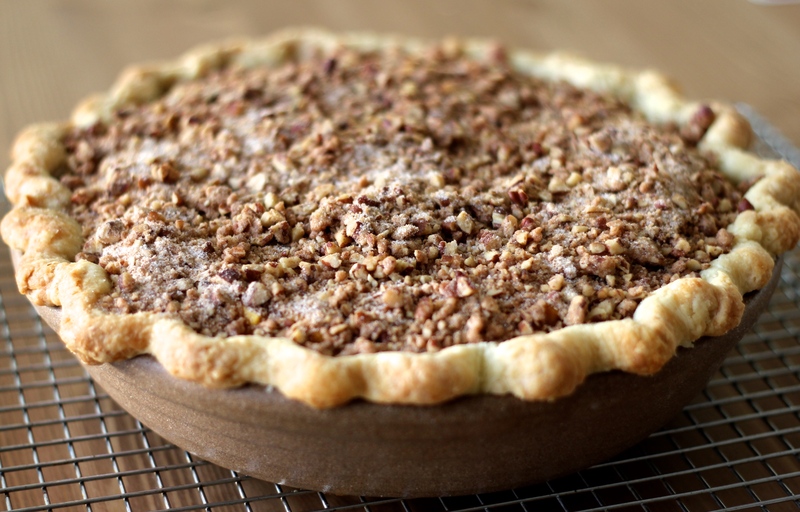 This has all the Thanksgiving favorites put together: Apple Pie, a light and mousse-like Pumpkin pie, and a Pecan Streusel topping. It’s perfect for breakfast, second breakfast, lunch, second lunch, dinner, second dinner…and anytime in between. I am speaking from experience. Start with the Pie dough. Place flour, salt, and sugar in a large bowl and mix well. Dice the cold butter and place in the flour mixture, as well as the shortening. Cut in with a pastry cutter until the flour and fats result in pea-sized lumps. Add 2-3 tablespoons of ice water to the dough and stir with a spoon until it starts to stick together. Add 2-3 more tablespoons of ice water until most of the dough roughly forms into a ball. You may need to add 2-3 more tablespoons of ice water until you get a mostly-formed ball of dough; don’t add more than 8 tablespoons of water, or your pie dough will be too dense and not flaky. Dump the dough out onto a floured surface and knead just 4-5 times until the dough comes together. Flatten into a disc and wrap in plastic wrap. Refrigerate at least 20-30 minutes. While the dough is resting in the fridge, prepare the pie filling. Combine the first six ingredients (the flour through the cloves) in a medium bowl and set aside. 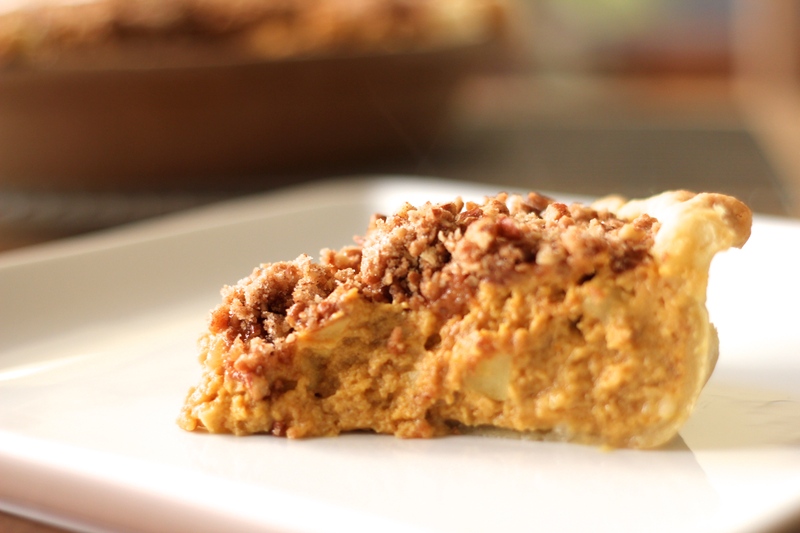 Whisk the eggs, pumpkin, and greek yogurt together. Add the flour spice mix and stir well until fully combined. The mixture should be like a thin pudding in consistency. Gently stir in the diced apples and set aside. Prepare the pie crust. Roll out your pie dough on a well-floured surface, rotating and turning over as needed to make an evenly rolled out crust. Add flour as needed so it doesn’t stick to your work surface. Your dough should be about 1/4-inch thick, and about 2 inches wider in diameter than your pie pan. Gently fold the dough in half, then in half again, so it looks like a triangle, and gently center the corner of your “pie dough triangle” in your pie pan. Open the dough and gently fit the dough into the bottom and sides of your pan. You want about 1 1/2 inches of “dough overhang” all the way around the perimeter of the pan; trim any excess dough. Gently roll the overhang dough under itself and crimp in your desired style. Pour filling into the prepared pie shell. Bake at 400 for 15 minutes. Reduce the temperature to 350 and bake for another 30 minutes. While the pie is baking, prepare the topping. Combine the sugar, flour, cinnamon, and chopped pecans. Cut in the butter until pea-sized lumps form, similar to the pie dough. After the 30 minute bake, pull the pie out of the oven. increase the oven temperature back to 400. 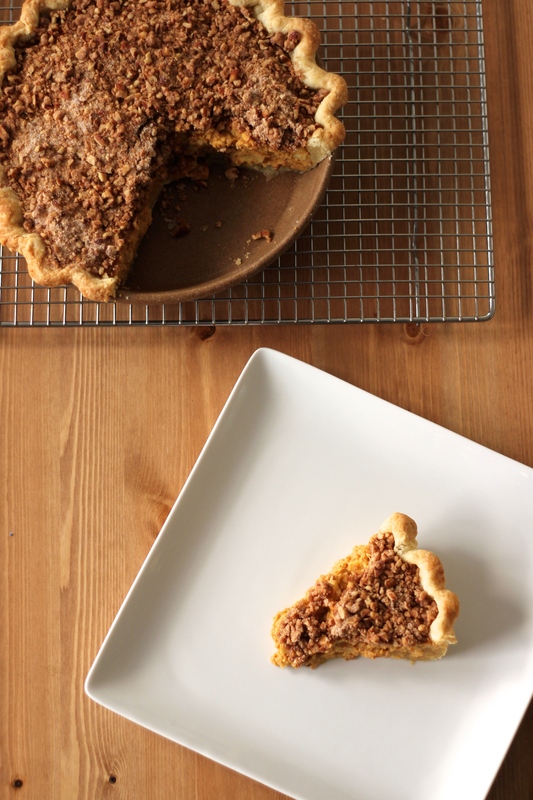 Sprinkle the pecan streusel topping evenly over the top of the pie and bake for another 10-15 minutes until golden brown on top.